The NTSB tweeted this photo of the train derailment. 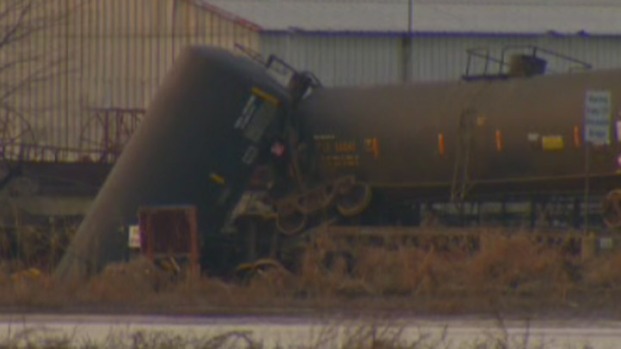 Emergency officials are back in Paulsboro, New Jersey Sunday to determine the exact cause of a train derailment and chemical spill that sickened 71 people and forced more than 100 people from their homes. Officials say they want to try and pump vinyl chloride out of a damaged tanker. They also plan to use a crane to remove the derailed cars. Evacuation orders are still in place for more than 100 residents who were ordered to leave their homes when the disaster occured Friday morning. Residents not staying at area hotels were directed to the Paulsboro fire department located at 1502 Swedsboro Avenue where a family assistance center was set up. The number for assistance and information is (800) 230-7049. On Saturday, a joint investigation by the U.S Coast Guard, NJ Department of Environmental Protection, NJ Office of Emergency Management, Paulsboro Township police and fire departments, and representatives from Conrail begin working together to determine the best way to get thousands of remaining gallons of chemicals, now in a solid state, out of a damaged tanker. As the NTSB continues to investigate the Paulsboro train derailment, several evacuees still can't return to their homes. 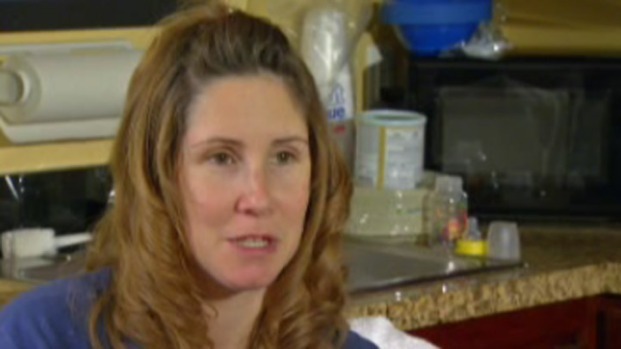 NBC10 spoke to one of the evacuees. The train, which carried 68 loaded cars and 14 empty cars, was traveling from Camden and derailed around 7 a.m. An engineer and conductor were the only people on board. The NTSB says the two spotted a red light while the bridge was closed, which is unusual. “He called dispatch over the radio and he received approval to cross the bridge and pass that red signal. Two locomotives and several cars had cleared the bridge. They were on the other side of the bridge when the crews stated they saw the bridge collapse and the train went into emergency braking application.” Deborah Hersman, chairman of the NTSB. 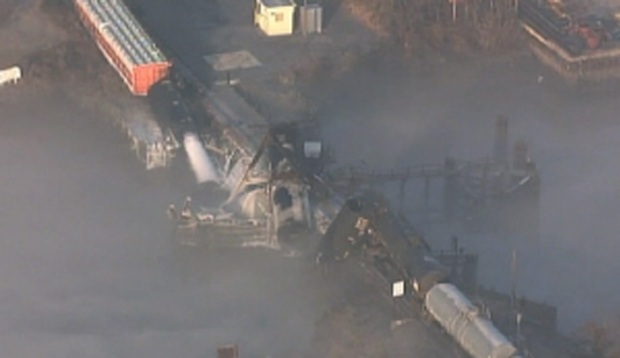 The NTSB continues to investigate a train derailment in Paulsboro that caused a chemical spill and the evacuation of hundreds of residents. There may have been a problem with a signal just before the trail derailed. Hersman said Saturday that train crewmembers have told investigators that a radio code used to change a light from red to green failed to work just before Friday's accident. The conductor got out of the train and visually inspected the bridge in Paulsboro, she said. The crew then called for and received permission to cross, she said. 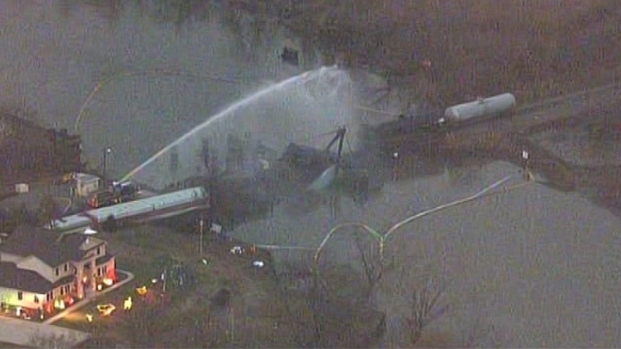 Seven of the CSX-operated train's 84 cars derailed, four tankers fell into Mantua Creek and one leaked some of the 25,000 gallons of the hazardous chemical vinyl chloride that it contained Friday. Residents were asked to stay inside their homes for hours after the hazardous material spill. And Friday night around 500 residents were evacuated from a 12-block radius around the derailment because officials feared that the cold air of the night could cause the chemicals to come back down to earth. 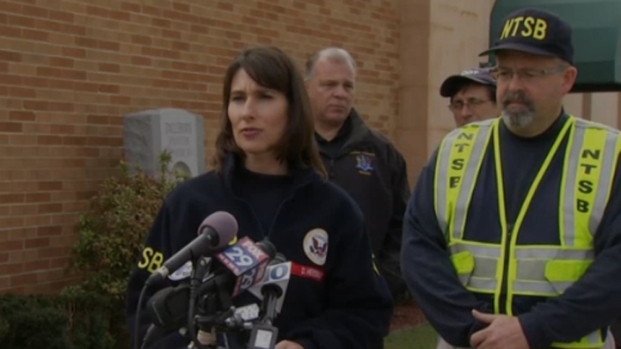 December 1, 2012: Debbie Hersman from the National Transportation Safety Board explains what happened during the train derailment in Paulsboro, N.J.
Underwood Memorial in Woodbury treated 71 people mostly complaining of breathing problems, burning eyes or scratchy throats after the incident. As of Saturday morning all the victims were released from the hospital, according to authorities. The bridge over Mantua Creek partially collapsed, but it's not clear whether the derailment or the collapse happened first. NTSB officials say their team of 17 investigators will first collect the vinyl chloride from the leaking train car and make sure no other cars are breached. A barge with a crane is being brought in from New York City to remove the damaged tankers. They are also investigating whether Hurricane Sandy had an impact on the integrity of the bridge. They will also interview crews of other trains that recently crossed the tracks. Police are asking residents living within 12 blocks of a train derailment in Paulsboro, N.J. to leave their homes Friday night as a precaution. NBC10's Chris Cato has details. The Department of Environmental Protection's Emergency Response Unit responded to the spill and conducted air and water quality tests. By late morning, state Department of Environmental Protection spokesman Larry Hajna said that sensors were not detecting the chemical at the site. Tom Butts, the chief of emergency management for Gloucester County, said it would take at least a day to get the large crane to the site to pick up the damaged cars. The recovery work was expected to take place only during daylight hours and it was not clear how long it would take. "It was crazy, it was very confusing in the morning but luckily everyone is alright," said Paulsboro resident John Pearce. The Conrail train derailed and the bridge collapsed -- for the second time in a little more than three years -- just after 7 a.m. Friday near Commerce Street. Four of the train cars dumped into Mantua Creek contained vinyl chloride, a colorless, organic gas with a sweet odor (Find out more about vinyl chloride and its potential health risks). One of the train cars was compromised, releasing about 180,000 pounds of the chemical into the creek, according to Conrail spokesperson John Enright. A train derailed in Paulsboro, N.J. back in 2009 when the bridge buckled. The bridge was rebuilt, but Friday's accident has some questioning the bridge's safety. NBC10's Dawn Timmeney reports. Breathing vinyl chloride, which is used to make the common plastic PVC, can make people dizzy or sleepy. Breathing very high levels can cause someone to pass out, and breathing extremely high levels can cause death. Most of the vinyl chloride is gone from the body one day after being breathed in. It's heavier than air and can travel along the ground, but it evaporates quickly. Anyone who thinks they're suffering any symptoms due to exposure is encouraged to seek medical advice. Residents were initially told to remain in their homes and local schools were placed on lockdown as emergency officials assessed air quality concerns. During the morning, Paulsboro School District was on lockdown. Students were dismissed when officials determined the air quality had improved. The School District's Superintendent Dr. Frank Scambia told NBC10 that 50 students from all three of the district's schools were on lockdown inside the gymnasium at the high school. Officials determined at about 11 a.m. that air quality had improved, meaning the situation was under control. However, they cautioned that the next significant threat will be when crews attempt to lift the cars out of the water without releasing any more chemicals. Roadways leading into Paulsboro were closed and the Fire Department also evacuated all employees on Commerce Street. Officials say the biggest concern could be the time when the cars are lifted out of the water, although they've already devised a plan to contain the vapors. During the process of righting the cars, residents could continue to expect temporary evacuations as crews worked to clear the gas and untangle the crash site. It could take some time to figure out exactly what caused the crash.